Click here for Lake Alexandrina at her best! Burning questions... ...more photos too! Australia's largest river system finishes its journey to the sea in broad and shallow freshwater lakes. Officially, the Murray Lakes are freshwater, and Adelaide's reserve water supply--which explains why Adelaide is building filtration plants. The lakes were originally semi-tidal estuaries. 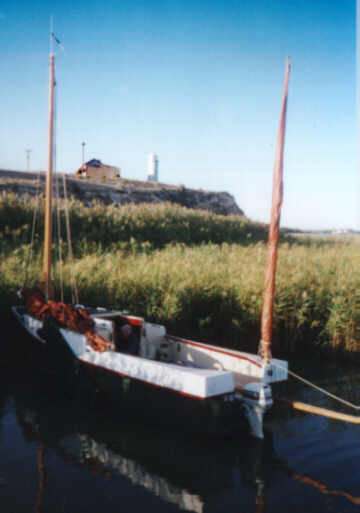 Barrages were built from the 1920s to keep the tides out and to raise the pool level for the steam navigation which the railways had killed a decade previously. The Murray Lakes are big and shallow: Lake Alexandrina, the largest, is some 360 sq km, with depths mainly 10-12 feet shoaling to 6 feet. The lake shores are low-lying and barren. Given the size of fetch and the shallowness, waves can build up to 5 ft rapidly. Waves are square and come very close together. The climate is thoroughly Mediterranean. In summer, winds tend to be light airs in the morning or gentle south-easterlies, and in the afternoon south to south-east sea breezes at 25+ knots. For variety, there can be scalding hot strong northerlies before the passage of cold fronts. Changes come from the south-west, with winds at near gale or gale. All of this makes the lakes themselves rather chancy and treacherous places, and they kill people occasionally. On the other hand, the protected waterways of the lower Murray River near Goolwa, and in the Coorong, are a delight of shelter, reedbeds, mudbanks and odd nooks and crannies. 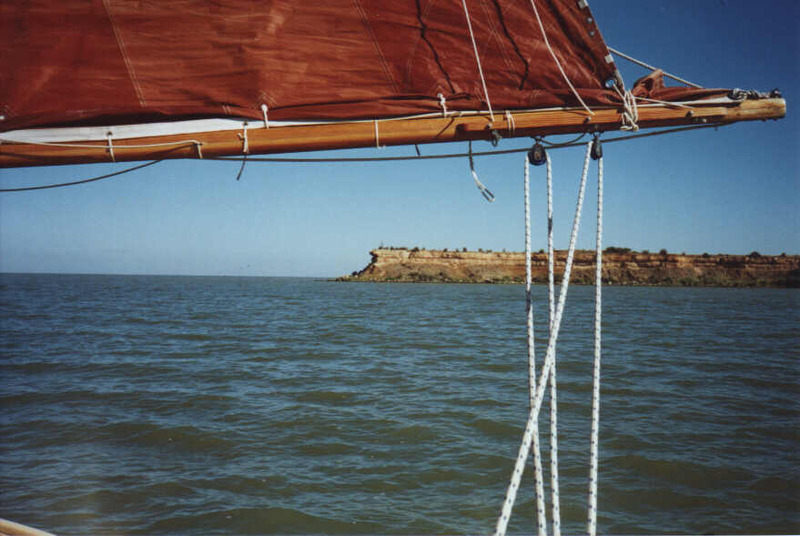 The Coorong, 150 km of narrow lagoon, is hardly frequented--apart from birds. Sailing in harm's way. 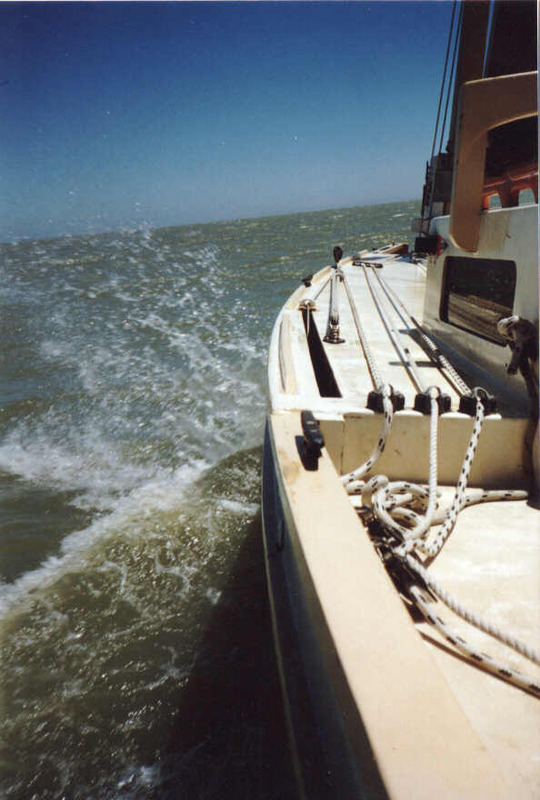 Martha Jane Shirley Valentine photographed from AS29 Lady Kate motorsailing in the dying early-morning light into an oncoming front on Lake Alexandrina, trying to catch the paddlesteamer Oscar W. Shortly after this photo was taken, Shirley Valentine was knocked down in a line squall and the sloppy reefing pendant on Lady Kate jammed the mainsheet. The Finniss River and Currency Creek estuaries between Clayton and Goolwa. Clayton Bay: the leading divisions of the Goolwa-Milang race just entering. Two locks allow access from the Lakes to the sea and the Coorong. 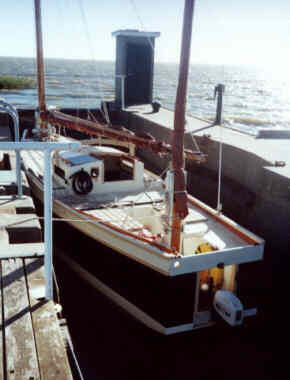 The larger lock, at Goolwa, is a manned lock capable of passing small ships. Larger ships can be sent through a navigation pass, created by removal of part fo the barrage. 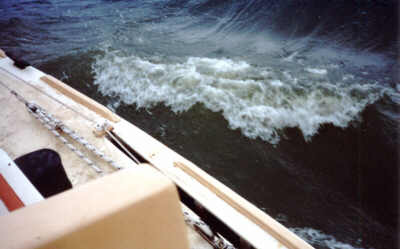 For a lot of the time, no-one can get out to sea, since the river's flow has been intercepted (for irrigation) to the point where a channel through the bar cannot be kept open. 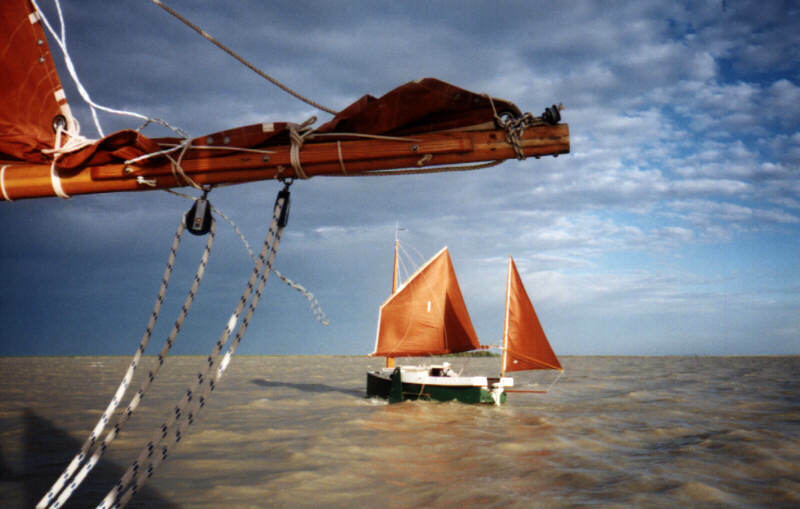 Photo (c) David Gill and courtesy Duck Flat-Wooden Boats. Here's Lake Alexandrina on a normal summer's afternoon. From the state of sky and the course of the Norwalk Islands Sharpie 23', this is a more-or-less stock-standard summer day, with the southerly sea breeze in at about 25 knots, and the chop picking up. A strong wind warning would not have been issued for these mild conditions. Note that while there must have been a second boat present for the photo (! ), there's no-one else in sight. 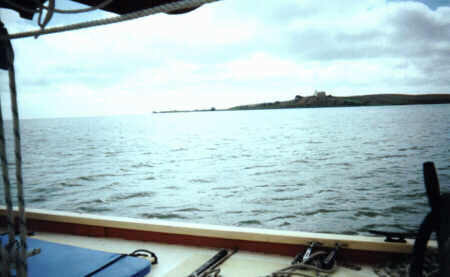 The Sharpie is on its way from Milang to Point Sturt, so the photo gives a good feel for the size of the lake (though at least there's land visible in this direction...) The hump in the distance is Mt Barker, 1696 ft, some 25 nautical miles distant northwest from the boat's probable position. The Lake is at 5ft ASL. To visualise the Light Schooner here, remove a bit more than half the NI Sharpie's freeboard, chop a foot off the beam and lower the sail rig a bit more. The NI Sharpie is enjoying the conditions. 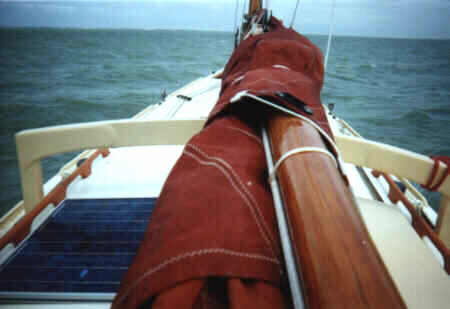 The Light Schooner would still be coping with the conditions under fore and reefed main (jib already down, staysail under lock and key), but the enjoyment factor would be reducing as backsides get soggier and go numb...if out for pleasure, we would be thinking very hard about going in another direction at this stage, watching conditions very carefully, and ready to drop the foresail. 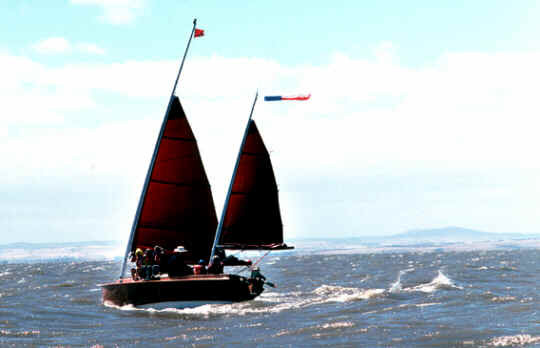 See our Scooner sailing tips. If we were racing, the NI Sharpie would now be leaving us well behind at a rate of knots (hiss, boo). But then again, gentlemen don't sail to windward anyway... 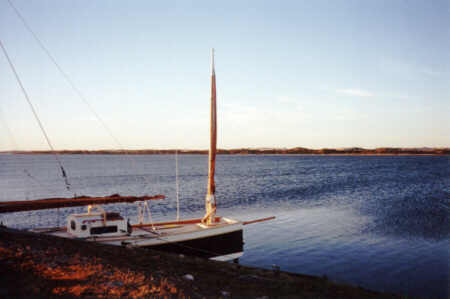 The wind and wave would be absolute delight on a broad reach, at which stage a Light Schooner would be planing furiously, surfing every wave, dipping her bowsprit under from time to time, have her staysail up but still probably a reefed main and no jib, and leaving the other sharpie behind (yesss!). or use your "Back" button if you came in some other way.